While many of us are forced to designate our crafting to our busy kitchen tables or kitchen floors, there are some lucky enough to have entire rooms to dedicate to their craft. 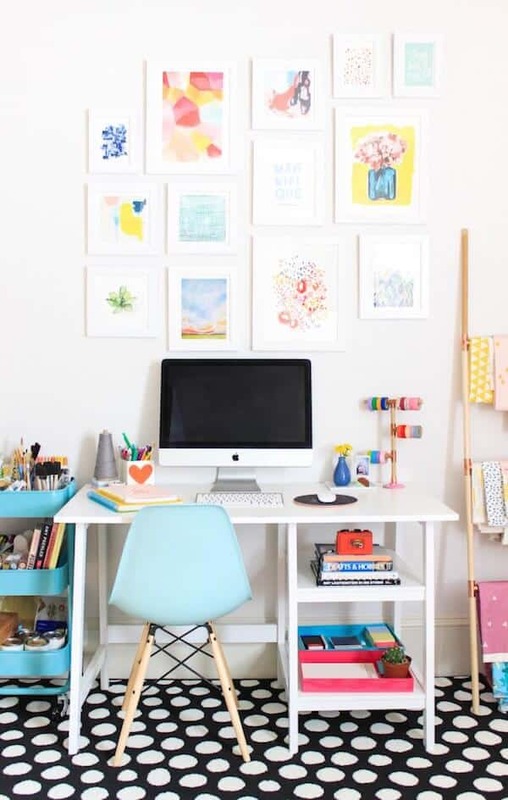 Home office, crafty corner, she space, whatever you choose to call it, crafting rooms are a great way for busy moms to escape the noise of their everyday lives and create something amazing. Which makes it only natural that these creatives would want their spaces to be as cool as possible. No matter how big or how simple, all of these rooms are admirable. 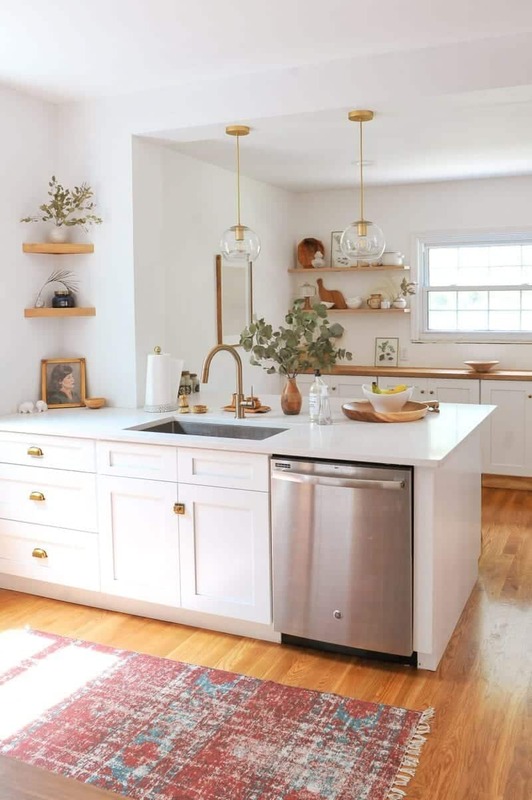 This creative crafter shares her home crafting space with her husband, making it essential to keep the space neutral and organized. The long desk spans the entirety of one wall and is topped with a few essential tools but otherwise kept clear. Instead of traditional storage, the duo choose to keep their crafting tools on handmade wall-based storage. Almost everything in the room is entirely custom built and perfectly personalized. 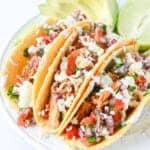 Craving Some creativity is full of amazing ideas ranging from DIY projects to great recipes. The custom built “craft island” is the center of this beautiful, open craft room. The blue canvas adds some much-needed color to the rest of the room, while the compartments all but get rid of the need for loads of other storage. 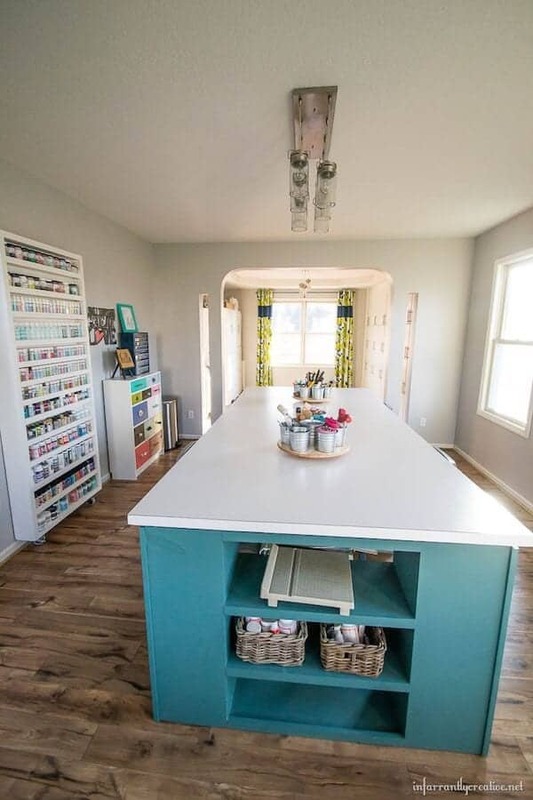 The other shining feature of this room is the secret paint door that holds tons of paints and supplies on the outside and opens up to reveal space for storing even more supplies. 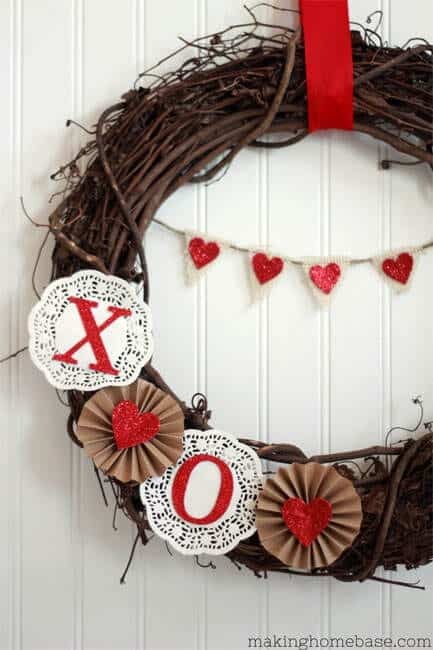 Head over to Infarrantly Creative to find even more amazing DIY’s. It may not show well in the photo, but this craft room is HUGE. 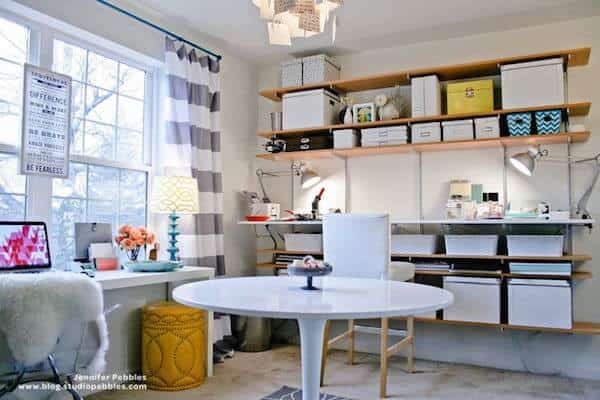 It’s got multiple nooks and crannies for storing crafting supplies and woking on projects, and plenty of space for using the space of other things if the need arises. The large crafting table has plenty of seats, the sewing station is outfitted for two, and the entire room has enough storage to hide as many supplies as you could possibly buy. 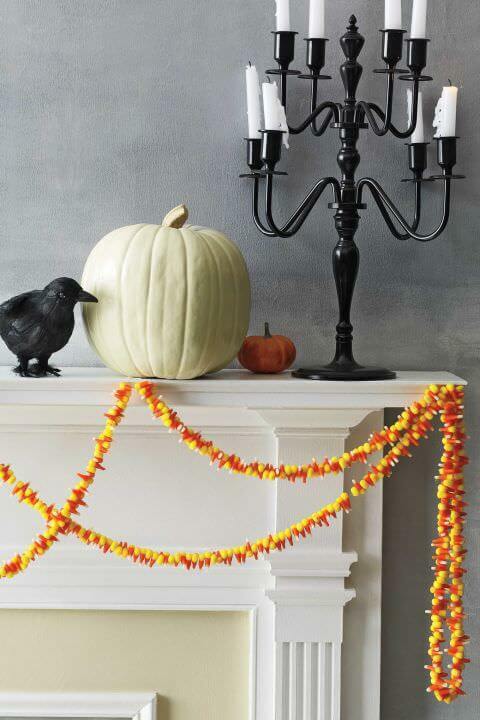 It’s a crafter’s dream come true. Check out Sugar Bee Crafts to find cool kids crafts, fun home projects, and even more! 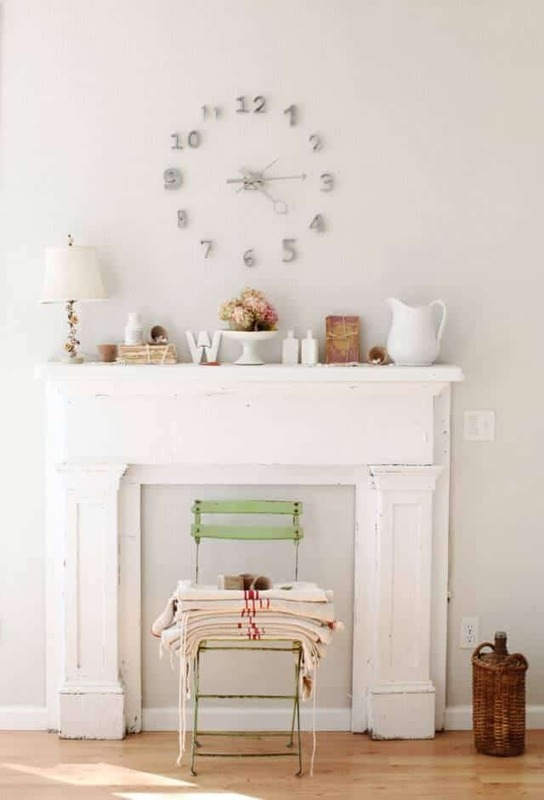 This crafting room is sweet, simple, and everything we love about rooms of this nature. The unassuming furniture is chic and comfortable, which makes it perfect for lounging around in during those long DIY sessions, and the colorful accents are absolutely gorgeous. This crafter expertly uses a simple drink cart at a portable storage accessory and also utilizes wall her available wall space perfectly. Visit White House Black Shutters to find tons of home design inspiration and DIY ideas. 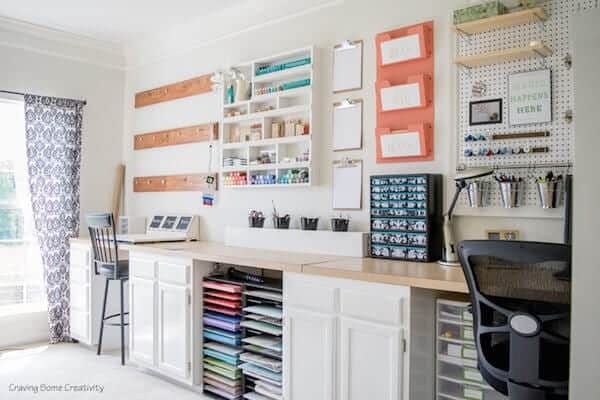 This busy crafter uses her available space as both a crafting room and a personal home office, and boy does she do it well. The simple decor is muted but modern, while the two different spaces are perfectly defined to keep order throughout the space. Loads of storage, a custom made chandelier, and a perfect view make this craft room a showstopper. Studio Pebbles is filled with awesome buys and great DIY’s. This cute crafting room is located in the heart of an unfinished basement. The room may be short on natural lighting, but it’s definitely full of flair. Cute colors, sassy decor, and all the storage you’ll ever need. What more could anyone ask for? Get amazing design tips and crafting inspiration at Classy Clutter. 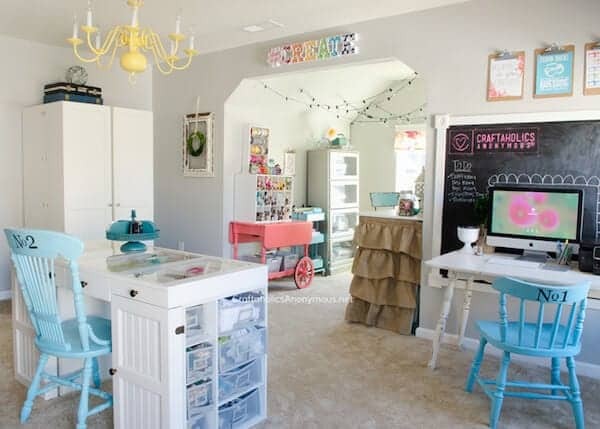 This gorgeous crafting room is what creative dreams are made of. With three completely different stations, DIY decor, and enough supplies to stock an elementary school, this room might just make us jealous if we didn’t admire its creator so much. Get yummy dessert recipes and crafts galore at Craftaholics Anonymous. 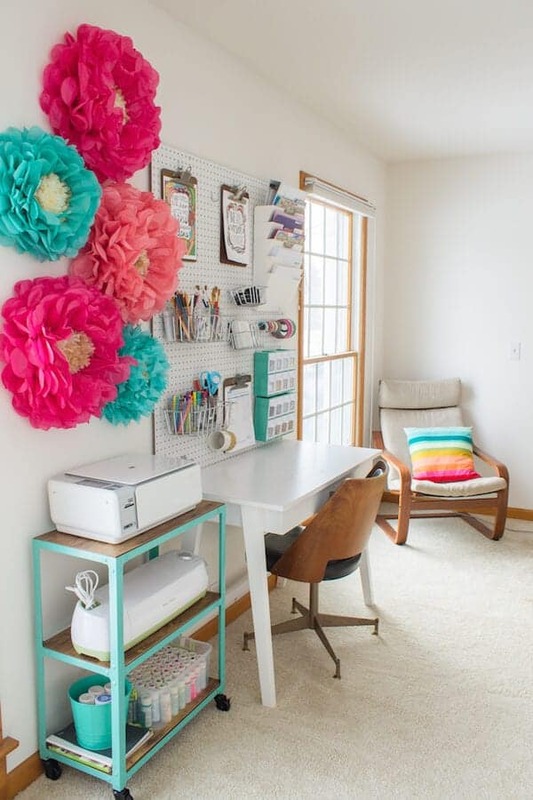 Another room that doubles as a home office and crafting room, this space is absolutely gorgeous. 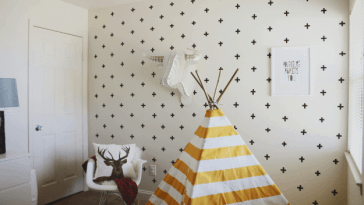 Beautiful, colorful prints, portable supply stations, and one swoon-worthy area rugs are only the tip of this crafty iceberg. Find fashion tips, DIY’s, and more at The Crafted Life.